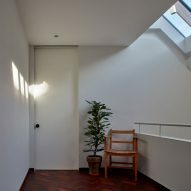 Skylights and large glazed surfaces that open onto a secluded courtyard allow natural light to pour into the interior of this house designed by architects David Liddicoat and Sophie Goldhill for a narrow site in east London. 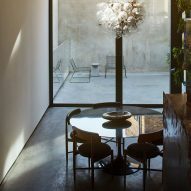 The husband-and-wife team, who run their studio Liddicoat & Goldhill from an office in Clerkenwell, bought the site for the Makers House in 2012. 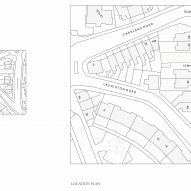 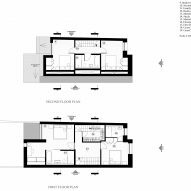 Over the following four years, the architects gained planning permission, raised the necessary finance and took on the role as main contractor to oversee the building's construction. 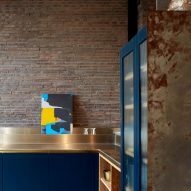 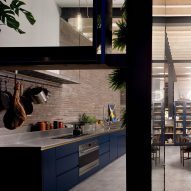 The project was undertaken as a speculative development without a client, so Liddicoat and Goldhill set themselves a brief to "explore the ideal texture and atmosphere of domestic architecture". 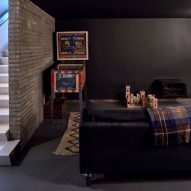 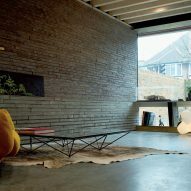 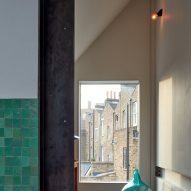 The house is located within a conservation area in the borough of Hackney and is surrounded by heritage-listed properties. 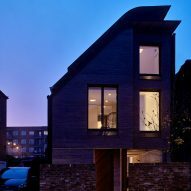 The design was constrained by the narrow site and the need to consider the neighbours' rights to light. 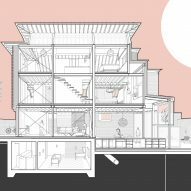 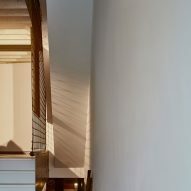 "Scrupulous computer analysis allowed the house's asymmetric form to be tuned to capture key moments of sunlight while forming apparently regular interior spaces," said a statement from the studio. 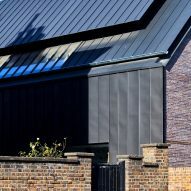 The resulting structure features a mono-pitched roof made from pigmented zinc that folds down onto the long southern elevation and frames an end wall clad in slender bricks. 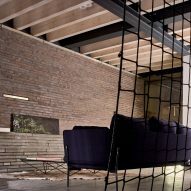 This palette of materials used in their raw state continues inside the building, where exposed structural steel and timber combine with reclaimed and repurposed materials. 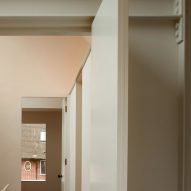 The property's entrance hall leads into a formal living room that steps down to connect with a kitchen and dining area at the rear. 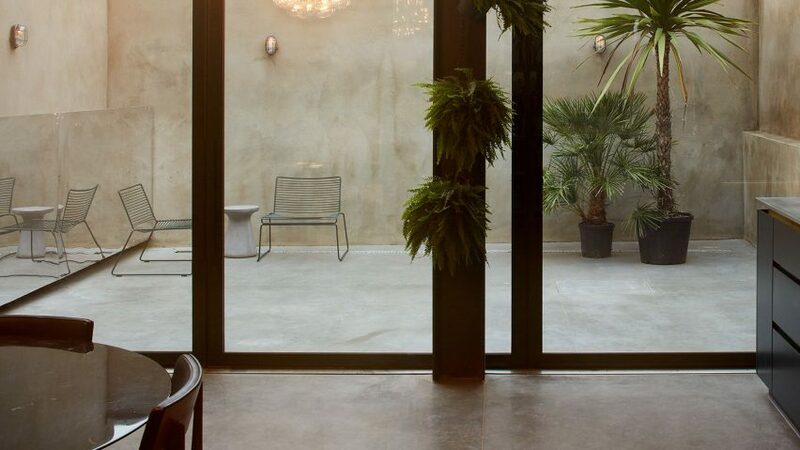 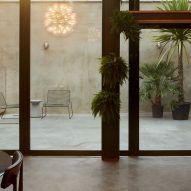 This space is lined with glazing including a pair of full-height glass doors and a large pivoting glass panel that opens onto a secluded courtyard garden. 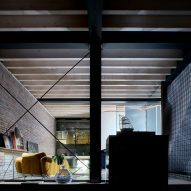 A further set of steps leads down from the kitchen to an excavated basement level accommodating a games room, utility room and larder. 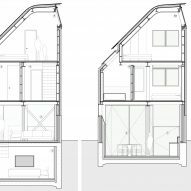 The split levels maintain a connection between all of these communal areas, which are separated without the need for partition walls or doors. 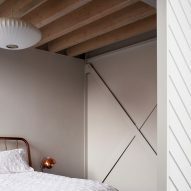 A selection of more lightweight materials is applied throughout the upper storeys containing the bedrooms, which all feature reclaimed Rhodesian-mahogany flooring. 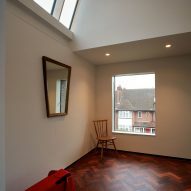 North-facing skylights enable daylight to illuminate a pair of bedrooms and the stairwell at the attic level. 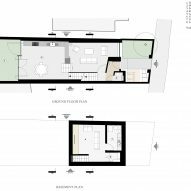 The first floor accommodates a guest bedroom, dressing room and a master suite, which are all arranged around a large landing that creates an additional space for socialising or relaxing. 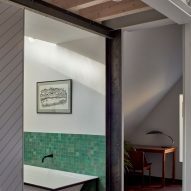 Further skylights inserted into the slanted roof on the southern side of the house allow daylight to flood into the landing and the master bedroom's en suite, which is separated from the sleeping area by a sliding cast-iron wall. 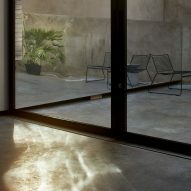 Photography is by Keith Collie.